UXBlog | IDV Solutions' User Experience: Coming Up in VFX 5.5: Driving Directions! Coming Up in VFX 5.5: Driving Directions! Version 5.5 of VFX will include a much requested driving directions feature. Using the Bing routing service, VFX provides an interface to complex route creation and manipulation in the context of your own data and other Visual Fusion capabilities. Simple out of the box routing with snappy route stop additions and editing. Capturing a Favorite or permalink will include your route information so sharing with colleagues (or some future version of yourself) is straightforward. Also, the directions are made available to your clipboard if you want to drop them into an email or document. 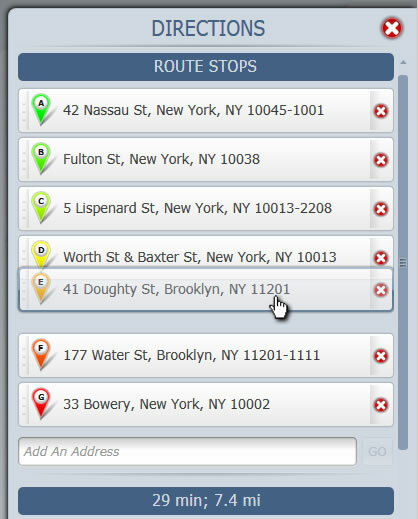 Adding stops to your route is available via a right-click action on the map. 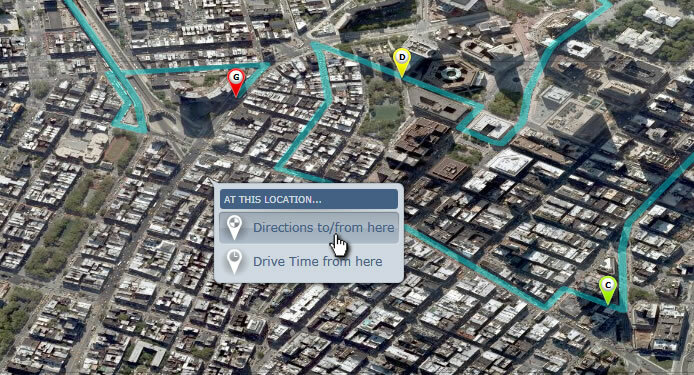 Alternatively, you can type in an address or use the address of an existing map point. Route stops can be dragged around to new locations as needed, or removed altogether. Stops along your rout can be reordered easily by dragging them. The new sequence will update the drive time and distance for some what-if type activities. Color-coded points indicate route order in the list and on the map, and the typical VFX cross-interaction pinging visual reference is provided. Now that's a map! Very nice! Are route stops going to work in reverse? For example, if I have a *known* list of stops, lets say for a truck delivering shipments to N places. Will I be able to set up a Stops collection and have the map draw those routes? Wow, this comment got by me, sorry I'm so slow in my response! Because the routing feature allows using existing map point features as route candidates, you could definitely have a collection of stops that you can manage and arrange. Also, they could be pulled in from a sharepoint list where you or someone else can have at them as well. When a user interacts with the route points or the route line, itself, the routing dialog will open (if it had been closed). 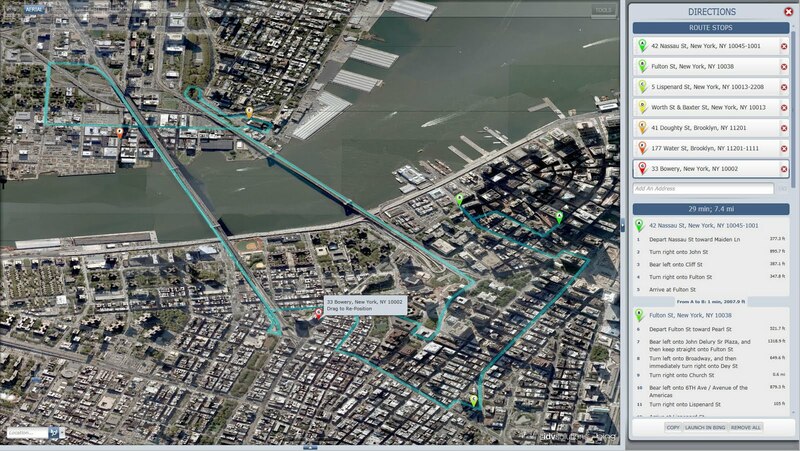 In that dialog you can manipulate the route as you see fit. Interestingly (serendipitously? ), using the routing feature in conjunction with the favorites feature will let you save many "scenarios" if you like, each with their own label annotations or whatever.